In Java, if you know Graphics or Graphics2D class, you can write your own code to create a simple chart to present data. However, if you do not want to spend one or two hours to write code to construct the simple bar chart or pie chart, using a third-part library is your best alternative. 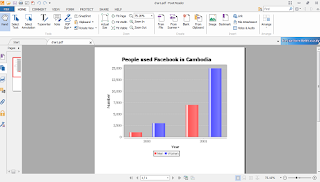 The free popular third library to construct different types of charts i recommend is JFreeChart. You can download the JFreeChart library and its dependency JCommons from here. There are many types of charts such as Bar chart, Pie chart, line chart, Gant chart, Polar chart, Ring chart and more that are supported by the JFreeChart tool. A chart created by the JFreeChart library can be saved in PNG image format, printed, or exported to PDF document. For the examples in this tutorial, we are going to create two charts, one Bar chart and one Pie chart. Before continuing to the rest of the tutorial, you will need to add the JFreeChart library (jfreechart-1.0.16.jar) and JCommons library (jcommon-1.0.21.jar) to the Java Build Path of Eclipse (Project->Properties->Java Build Path->Libraries->Add External Jars...). When you create a Bar chart or Pie chart, there are three steps that should be undertaken. The first step is creating the dataset for the chart. The second step creates the chart object that wraps the dataset and the last step shows the chart on the frame window. For the Bar chart, you can construct the dataset by using the DefaultCategoryDataset. This class has a method called setValue that can be used to set the values, row keys, and column keys to the chart. 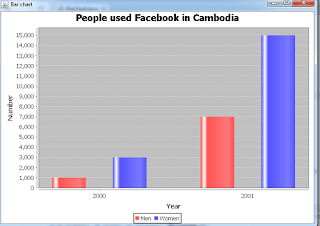 To create a Bar chart, you will use the createBarChart or createBarChart3D method of the ChartFactory class. The createBarChart method allows you to create a simple Bar chart with 2D effect. If you want the Bar chart with 3D effect, you will use the createBarChart3D method. With these methods, you can specify the chart title, category label, value label, and dataset. 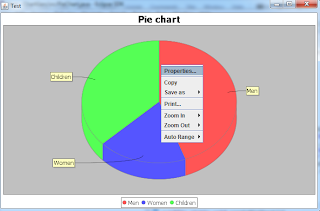 After the chart object is created, it is ready to show on the frame window. It is easy. The ChartFrame class allows you to create a frame window. You need to provide the frame title, and the chart object that you created in the second step. Then call the pack and setVisible methods to show the window. 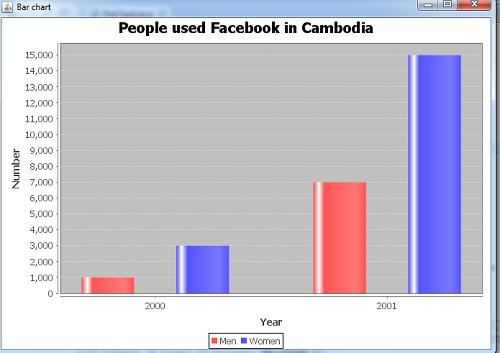 Here is the complete program to construct a Bar chart with. 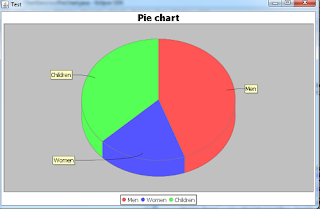 For a Pie chart, you will use the DefaultPieDataset to create the dataset object for the Pie chart. This class also has the setValue method that you can set the value for each category of the chart. The createPieChart method of the ChartFactory class allows you to create a Pie chart with 2D effect. If you like 3D effect, you can use the createPieChart3D instead. The JFreeChart library allows you to save the chart objects in PNG image format, print them to the default printer, set chart properties (title, font, color, ...) or copy the chart to other applications easily without writing a single line of code. You just right-click on the chart then select a task from the popup menu. If you want to save the chart in PDF file format, you will do more code. Don't worrry. It is not hard. The JFreeChart class allows you create BufferedImage object from the chart object by using its createBufferedImage method. When you get the BufferedImage object, you can convert it to an image object and write this image object to the PDF output file by using the iText library. You need add the iText library to the Java Build Path as you did with the JFreeChart library. I am glad to read this, very succintly and up to the point. Great work! I am waiting for your new posts! Try some great templates http://www.pptstar.com/diagrams/pie-charts/ for your charts! I use them to make these pie charts for my blog.